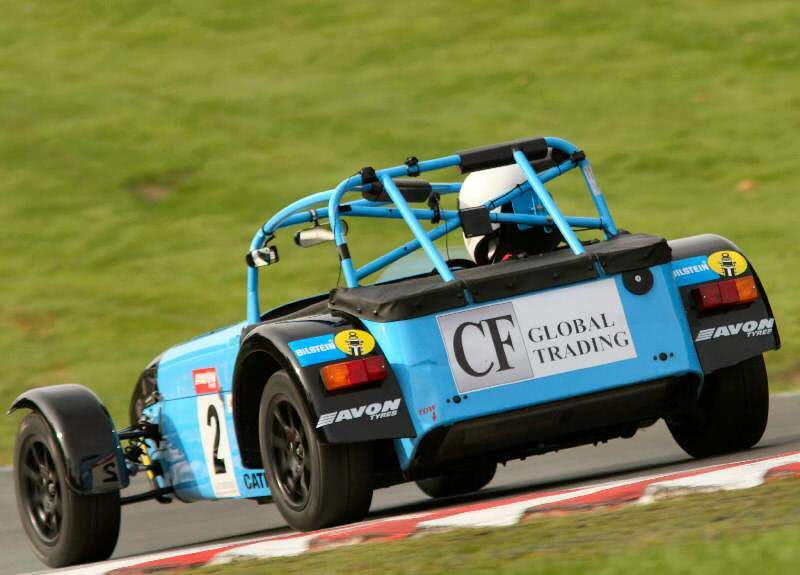 Oulton Park: DPR Motorsport wins its second inaugural Caterham championship with three races in-hand. James Maclachlan removed the last remaining doubts as to the outcome for the new Caterham Supersport championship by gaining pole and two double firsts in the penultimate round at Oulton Park. This time it was Nathan Lindop, taking full advantage of his local knowledge, who kept Maclachlan under constant pressure. Maclachan’s race one lead from Lindop, after 30 minutes of intense racing, was just 0.2 seconds and for race two this reduced to an almost imperceptible 0.055 seconds. Running as the official MSA entrant for James Maclachlan, this represents a further inaugural win for DPR Motorsport following their win in the 2009 Caterham Superlight R300 championship. Maclachlan has enjoyed what must surely be a record breaking run of race wins in the new Caterham Supersport Championship, with only a mere second marring his run of eleven firsts. After allowing for the all-important dropped scores that impact the championship points, Maclachlan came to Oulton with a 23 point championship lead. With only 40 points left in play, a 20 point race win in race one would nail the championship for Maclachlan despite the three remaining races. Any doubt as to Maclachan’s intent was quickly removed by his blistering pole some 0.2 seconds ahead of Lindop and, more significantly, almost 0.6 seconds ahead of his potential championship rival, Robert Smith. However in race one it became clear that the man to put Maclachlan under pressure was going to be Nathan Lindop driving a superb race on his local circuit. Pushing hard from the outset, Lindop took and held the lead for the middle part of the race. However with Maclachlan pushing even harder, the lead was regained and Maclachlan was once again the first man across the line some 0.2 seconds ahead of Lindop with Robert Smith taking a now academic fourth place. Race two demonstrated that both Maclachlan and Lindop were driving in the first division with the rest of the field some way behind. For all of the thirty minute race it seemed that Lindop’s car was somehow almost glued to the rear of Maclachan’s bright blue Supersport. Despite the immense pressure and close racing, Lindop was never quite able to complete a pass; Maclachan’s command of the track denied Lindop any real opportunity. Almost side-by-side Maclachlan passed the line just 0.055 seconds ahead of Lindop.